Dr. Caldicott talks with Alex David Rogers, a Professor in Conservation Biology at the Department of Zoology, University of Oxford and scientific director of the International Program on the State of the Ocean (IPSO). Read the IPSO reports State of the Ocean and Implementing the Global State of the Oceans Report. 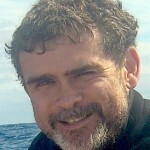 Prof. Rogers’s research focuses on the diversity, ecology, conservation and evolution of marine species. He is internationally recognized for his expertise in deep-sea ecology and human impacts on the oceans. Prof. Rogers has also worked extensively with governmental, intergovernmental and non-governmental organizations on impacts of human activities and climate change on marine ecosystems, particularly the high seas, deep-water ecosystems and coral reefs. For some background, read the articles World’s oceans in ’shocking’ decline, Shocking Report Exposes Ocean EMERGENCY: Must Achieve Zero CO2 Emissions Within 20 Yrs, Remove Gasses From Air, Experts Say, Coral Reefs ‘Will Be Gone by End of the Century’, As Oceans Get Warmer, Congress is Facing Heat, It’s Not Just BP’s Oil in the Gulf That Threatens World’s Oceans, Are Our Oceans Dying? Phytoplankton has Declined Terrifying 40% in 60 Years, Warming Oceans Cause Largest Movement of Marine Species in Two Million Years, Explosion in Jellyfish Numbers May Lead to Ecological Disaster, Warn Scientists and the National Geographic story, The Acid Sea. Also read Dr. Caldicott’s 2009 book If You Love This Planet which has a chapter on ocean pollution. This entry was posted on Friday, September 9th, 2011 at 12:00 am	and is filed under Uncategorized. You can follow any responses to this entry through the RSS 2.0 feed. Both comments and pings are currently closed.